지리산 중턱에 있던 석남암사지에 있다가 현재 내원사로 옮겨 놓은 돌로 만든 비로자나불상이다. 비바람에의한 마멸 때문에 세부표현은 명확하지 않지만 당당하고 세련된 모습이다. 머리 위에 있는 상투 모양의 머리(육계)는 높고 큼직한 편이나 약간 파손되었으며, 둥근 얼굴은 부피감이 풍부하여 8세기 불상의 특징을 잘 보여준다. 상체는 건장한 모습으로 자연스러운 가슴, 허리의 굴곡, 어깨나 팔의 부피감 등에서 사실미를 잘 표현하고 있다. 전신을 감싸고 있는 옷은 얇아서 신체의 굴곡을 잘 드러내고 있으며, 옷주름 역시 촘촘하고 부드럽게 표현하여 8세기 불상의 옷주름 특징을 보여주고 있다. 손모양은 왼손 검지를 오른손으로 감싸 쥐고 있는 모습으로 이 불상이 비로자나불임을 알려주고 있다. 불상이 앉아있는 대좌(臺座)는 상대·중대·하대로 이루어졌는데, 8각의 하대에는 아래를 향한 연꽃무늬를 새겼다. 중대는 8각의 각 모서리마다 기둥을 새겼으며, 상대에는 2겹의 연꽃무늬를 새겼다. 부처의 몸에서 나오는 빛을 형상화한 광배(光背)에는 연꽃무늬와 불꽃무늬가 새겨져 있는데, 위에서 오른쪽으로 비스듬히 하단까지 깨져 약 3분의 1정도가 없어져 버렸다. 대좌 중앙의 구멍에 있었던 사리호(舍利壺) 표면에 기록된 글에는 신라 혜공왕 2년(766)에 비로자나불상을 조성하여 석남암사에 모신다는 내용이 있다. 이 불상은 비로자나불상의 가장 빠른 조성 예로 조각사 편년 및 사상사 연구에 크게 기여하고 있다. 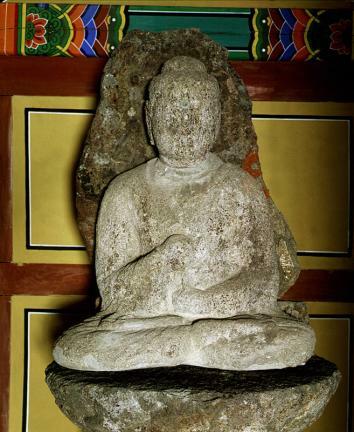 This stone statue of Vairocana Buddha was originally located at the site of Seongnamam Hermitage in the middle of Jirisan Mountain before it was moved to its current location in Naewonsa Temple. The surface is unclear due to weathering, but it has a majestic, refined shape. The topknot on the head is somewhat large and high but slightly damaged. The face is round and voluminous enough to demonstrate well the typical characteristics of the Silla Buddha statues made in the eighth century. The top of the body is strong, expressing well the beauty of reality in the natural chest, contour of the waist, and voluminous shoulders and arms. Since the right hand wraps the left forefinger, it means that this statue represents the Vairocana Buddha. The bottom of Buddha’s body is wide compared to the low height. It is finished to look stable in case it can only stand on the high pedestal. The robe draped over the whole body is thin, revealing the contour of the body. The pleats are expressed in a compact, soft way, showing the characteristics of the pleats of a Buddha statue made in the eighth century. The pedestal consists of the top, middle, and bottom parts, and the octagonal bottom is carved with a lotus flower facing downward. In particular, the middle part of the pedestal is carved with a pillar design on each octagonal side, and the top part, with a double-layer lotus design. Lotus and flame patterns are carved on the mandorla, but a third of it is now gone because it was broken up to the bottom in a slanting way to the right. 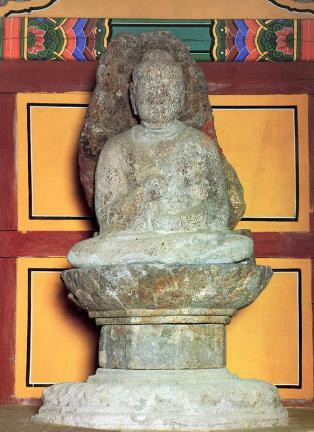 The inscription on the surface of the reliquary placed within the hole and found at the center of the pedestal states that the Vairocana Buddha was created in 766 (second year of the reign of King Hyegong during the Silla Period), to be enshrined at Seongnamam Hermitage. It is one of the earliest examples of Vairocana Buddha statues, contributing significantly to studies on the history of carving and traditional philosophies.